Ep. 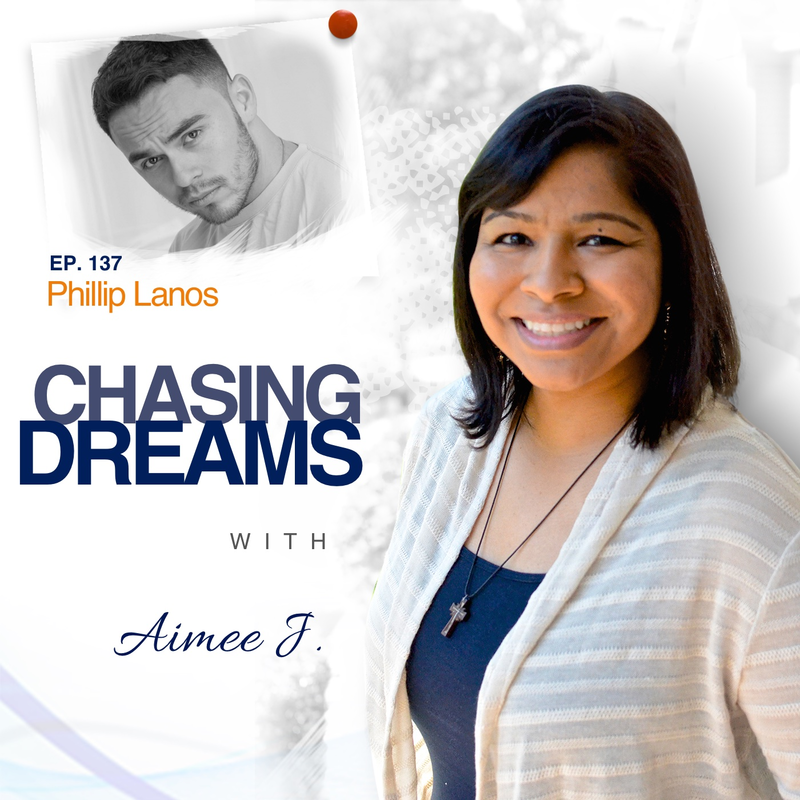 137: Phillip Lanos ­- Realizing When You’re Talking Yourself Into a Dream | Aimee J.
Phillip Lanos is a Los Angeles native. Hyperactive and often pensive, this actor, singer, songwriter, and podcast producer is best experienced in person. Due to his half-Mexican, half-French descent, he’s had opportunities to appear on international Latino TV channels like Telemundo for an American Idol spin-off show named “Yo Soy El Artista.” Phillip has also appeared on MTV’s “Copycat,” which was MTV’s attempt at singing competitions. In the podcasting world, Phillip has worked on over 300 episodes with entrepreneurial clients and journalism greats like Cal Fussman and Martin Perlich, and YouTube influencers like Roger Burnley. singing career, taken intentional steps and moved across the country to pursue those dreams. When he landed in NYC, he secured a great job with a well-known marketing agency, even though he felt terribly unqualified. He found a mentor, worked hard for success, and was soon offered a great position with a big salary. He turned it down. Why? He didn’t want to “settle” without at least trying something in which he could be his own boss. He walked away from those opportunities to truly pursue his passion. Have you ever had to start over, refocus, and redirect your efforts? Phillip knows what that’s all about. He moved in a new direction by leaving NYC and moving back to Los Angeles. He had to regroup in order to plan for his success. There were certain boxes he wanted to “check” in his life so each plan and strategy had to be tested and measured. He wasn’t looking for one-dimensional success. He has since realized that you can have failure AND success at the same time in different areas of your life. It all comes down to what you’re willing to sacrifice for your dreams. What is your deepest insecurity? For Phillip, it’s the “I’m not good enough” voice. You may think that’s unusual for an actor, but it’s really quite common. Phillip expresses this vulnerability in over-achieving or under-achieving, all in a quest to find balance. Phillip grew up as one of 18 siblings, with parents who weren’t a big part of his life. HIs father was diagnosed with ALS when Phillip was only 8, so he has few memories of good times with his father. Because of his family background, Phillip has keenly felt the need to make his life count. For this reason, he is very intentional about crafting his plan for success.